For the most part my stay at myrtle Beach Resorts Was ok.
My experience was horrible to say the least. The carpet in the master bedroom was dirty. The second bedroom one of the beds was missing the top cover sheet. The hot water wasn’t working properly. The wash clothes was dirty full of red stains on them. And both bathrooms only had a half of roll of tissue in each bath. Wasn’t even enough to get started before a store run had to be made. I am so glad we only used the condo for sleeping purposes and to try and shower. That we wasn’t there to experience all of what else that wasn’t discovered. Thanks for your review. The carpet is clean but stained. We will be replacing that. We ask that you contact us if you encounter any problems (hot water? ), lack of promised supplies (toilet paper, sheets), while you are here, so that we can rectify them while you are here. We never heard from you until this review. We'd like to offer you a 10% rent discount on a future trip, if you'll give us another chance. It was wonderful. The condo was nice and clean. We were close to the beach and close to all the local happenings. It was great! 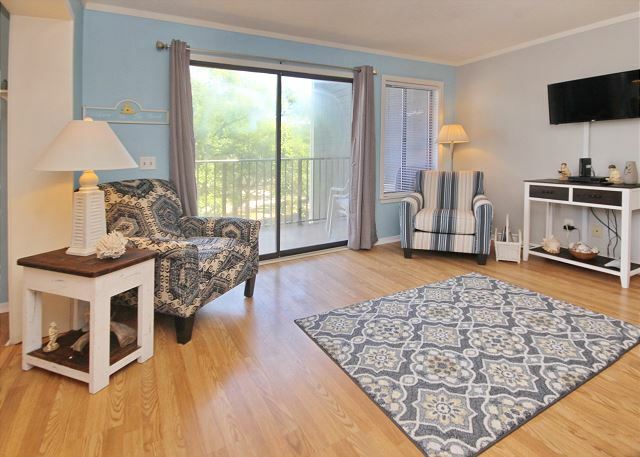 The condo looked just the website photos & was very nicely decorated & clean with new furniture. Management came by immediately & adjusted the patio door locks & made sure we were satisfied with the unit. Would definitely stay again! The Myrtle Beach Resort is a wonderful place to stay. Beautiful location, easy access from the airport and all the amenities of home. The apartment was very clean, all the appliances and amenities were in great condition. Close to everything-only problem was the elevator kept breaking and we had a lot of kids to use the stairs. Room was great and enough space for all.